The story behind the last person executed in the Tower of London. In the early morning hours of May 12, German spy, Karel Richter landed by parachute near London Colney. Originally a Czech citizen from the Sudetenland, in 1938, Karel suddenly found himself a defacto German when the Sudetenland was appropriated by Nazi Germany. 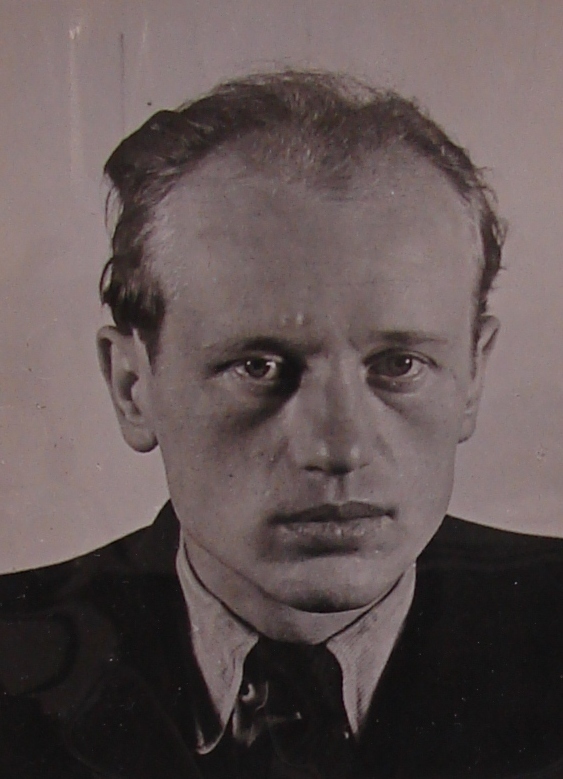 A seaman by trade, Karel abandoned ship with the declaration of war in 1939 but was eventually nabbed by the German authorities and thrown into prison. After kicking his heels in prison for a few months, Karel was "encouraged" to take on an espionage mission to England for the German Intelligence Service (Abwehr) but, as with many of the 1940/41 spies, he was a lackluster agent. After burying most of his gear upon landing, including his food, Karel hid in the wood near his landing site for several nights. Finally, on the evening of May 14, Karel snuck out of hiding and made his unsteady way to a nearby roadway. Two men in a lorry asked him for directions to London and his mumbled and surly reply aroused their suspicions. Encountering a Reserve Police Constable a bit farther down the road, the lorrymen passed along their concerns about the weird stranger. P.C. Scott approached Karel and learned that he was not feeling well and wished to be taken to a hospital. Sergeant Palmer in St. Alban's was called and, upon arrival, took one glance at Karel's Identity Card and recognized it for a forgery. Karel's career as a spy was over and the next day he was taken to MI5's Camp 020 for prolonged interrogation. Karel was eventually charged under the Treachery Act, tried by a civil court and found guilty. He was hanged at Wandsworth Prison on December 10, 1941, by Albert Pierrepoint. When one has access to the National Archives Security Service files on Karel Richter, his story is pretty clear. Unfortunately, some strange rumours have popped up in the last few years that muddle the waters. A few weeks ago, I came across a WW2 People's War account on the BBC that painted a slightly different picture of Karel's capture. Given the fleeting nature of some webpages, I have reproduced the account of Florrie Cowley (née Chapman) here in its entirety. During World War Two, signposts and anything giving the name of the village or town were removed and organisations' camping grounds were closed, and left to nature, as it was considered unsafe to venture out into the wild countryside. My friend Rene and myself were Rangers, senior guides, and bored with restrictions and the stress of war decided it would be fun to visit our Divisional Guide camp site, Cherry Green Trees, Tyttenhanger Park, Colney Heath, and cook a sausage our mothers had managed to obtain off the tight meat ration, over a camp fire as we had done pre-war. It was Spring, May time, and the weather was good as we happily cycled on our way and eventually arrived at the farmer’s house, where we obtained the key, and took the narrow, overgrown footpath winding through the fields to the site. The site consisted of a very large field on which stood a wooden hut, which in the large room was stored tents, blankets, and camp cooking utensils and in the smaller room was set out as a kitchen and held indoor cooking utensils, crockery, etc. Across the far side of the field was a small wood. We opened the door of the hut, undid the shutters, and were absolutely astounded as we saw there were a few tins of food and an opened fresh bottle of milk. In a hut which had not been used since war was declared in September 1939! We gingerly went through the door of the large room and opened the shutters. One was broken and held up to give the impression it was locked and on the floor was a bed made up of tents and blankets etc. What did annoy us was our large camp site Union Jack was the top cover of the bed. How dare anyone do this - it had cost us a lot of money! Someone was obviously living there. We quickly came out to think the situation over. Being war time there were no vagabonds, tramps etc around so who could be living there? We then thought a German Spy could have been dropped and this would be an ideal place to hide or live. This thought made us very frightened as, if we were discovered, he would be sure to kill us. Rene, thinking only of the prospect of lighting a fire and cooking her precious sausage, said we could go back to the farm after we had eaten. My thought was to get away immediately. Contemplating, she agreed. At the farm the farmer pointed to his phone and gave me the police phone number. In a short while two policemen arrived by car and went to our camp site. When they returned they stated we were to go home and on no condition tell anyone of what we had discovered. We thought the Divisional Commissioner ought to be told but the police were insistent - NO ONE. A week or two later, I think it was in a St Albans newspaper, that a spy had been caught. I personally did not see it. I did make a few enquiries after the war but found out nothing and so ended our adventure. Not so. Sixty-two years later I went on an outing to the Imperial War Museum in London and in the 'Spies' section there it was - a German spy caught in Tyttenhanger Park, London Colney on 14th c. Karel Richard Richter. He had been dropped by parachute on 13th May 1941 and was caught by the Home Guard and taken to Tess Road Police Station. There was no doubt whatsoever that this was 'our' spy, the date and place were right and naturally the Home Guard had been alerted by the police and succeeded in the capture. What a different story it may have been if we had not visited our camp site. He could have lived there undiscovered for a long time as it was an ideal hiding place, especially with the adjacent wood. Or, if he had seen us two Rangers we would have been shot. On the evening of the visit to the Museum I had the History Channel 101 10pm on the TV and suddenly heard the name Karel Richard Richter, which was so fresh in my mind. It was under the 'Spies who fooled Hitler' and referred to many spies who turned into double agents. Apparently Richter told our authorities so many lies that they could not believe a word he said. At first they thought he was a Master Spy checking on the German spies over here, then there were several stories which he periodically changed so in the end they stated he was 'unreliable and a liar' and so he was taken to the Tower of London and hung on 10th December 1941. On hearing my story my cousin who was a Security Guard at the Tower of London said many years ago a company were making a film which included spies shot at the Tower, and he was asked to sit on a chair, with lots of gun holes in it. This he did. So we wondered was Richter shot and not hung and this was the actual chair he died in. The date was similar. Florrie's story, while quite entertaining, is highly unlikely. Based on the facts outlined in the MI5 files, Karel was apprehended thanks to two suspicious lorrymen. Karel was also not executed at the Tower of London, but rather at Wandsworth Prison. An online forum, Brookmans Park Community Discussion group, had also come across Florrie's account, and some of the contributor's noted the obvious discrepancies. WW2 People's War - comment on Florrie Cowley's account of a "spy". This comment is utter rubbish. There is no plaque on Richter at the Tower of London for Richter was never held there, nor was he executed there. As for signed autographs? Highly unlikely. It would appear that, over the years, some spy stories have gotten blended together, including those of Josef Jakobs and Karel Richter. 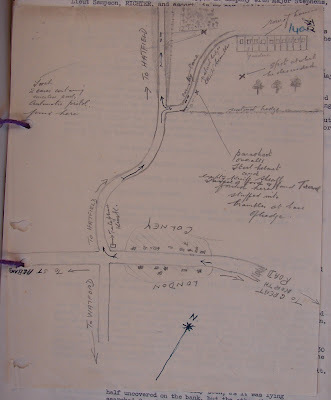 Finally, a glance at a map of the London Colney area, using information in the MI5 files, would weigh heavily against Richter being the "vagrant" who had invaded Cherry Green Trees camp. The red marker is the most likely landing point of Richter based on a hand-drawn map in the MI5 files. The purple marker is the Cherry Green Trees camp. The blue marker is the Tess Road Police Station. One commentator in the above-mentioned forum noted that he could find no trace of a Tess Road Police Station. The son of the one of the Reserve Police Constables from St. Alban's has however, pointed out that Tess Road has long since been renamed Woodstock Road South and that the former Tess Road Police Station was located in Fleetville, St. Alban's, near the Fleetville Post Office. During Karel's civil trial, the prosecuting attorney noted that he was first taken to the Fleetville Police Station, more than likely identical with the Tess Road Police Station. Google Map showing areas associated with Karel Richter. The above map can also be viewed as a saved map in Google Maps. 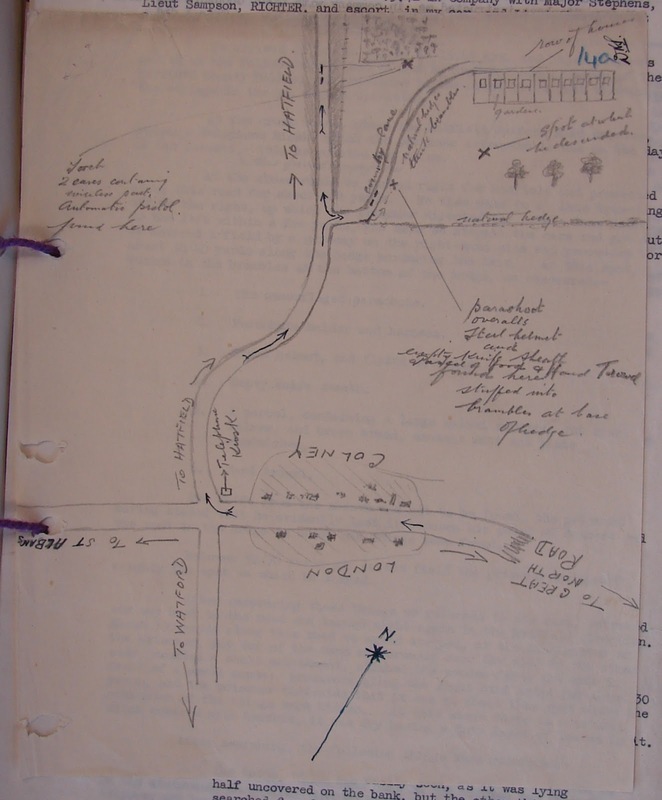 Below is the hand-drawn map from the MI5 files (KV 2/30). The map is not drawn to scale nor are the directions entirely accurate. But the overall layout is clear. 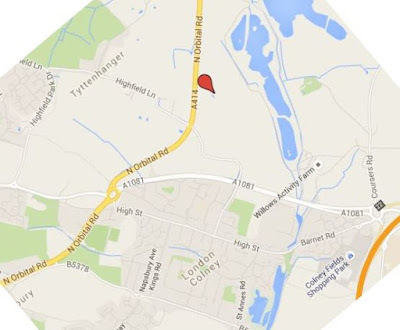 According to the write-up that accompanies the map, the laneway along which Richter landed (upper right corner of the map) was about 500 yards from the intersection of the Hatfield and St. Alban's roads in London Colney. If we tilt the Google Map to mimic the overall pattern of the MI5 map, we see that the red marker is in the general vicinity of Richter's landing area. The only problem is that the red marker is about 1000 yards from the Hatfield/St. Alban's road intersection, not the 500 yards noted in the MI5 description. There is, of course, the very strong possibility, that London Colney's growth over the last 75+ years has altered the scene of the crime to such an extent that an accurate deduction of Karel's landing place is no longer possible. One would need to examine 1940s maps of London Colney and compare them to the current topography. Google Map - London Colney and Karel Richter's likely landing spot. Note - Since writing this article, I did some more research - check out the latest blog post. I am one of the granddaughters of Josef Jakobs and have been researching his life for the last 30 years. You can use the form below to contact me. Copyright - 2014 - Giselle K. Jakobs. Travel theme. Powered by Blogger.